The full moon rising on March 5, 2015 will be the "apogee" full moon, meaning that the lunar body is at its farthest distance from Earth for the year. The first celestial object that attracts the attention of many people at a young age is the ever-changing moon. The lunar surface appears to go through phases over the course of a month, but what causes the moon to shine differently from week to week? The moon itself shines by reflecting sunlight. And other than the sun, the moon is far larger in angular size than any object in the sky. In fact, a full moon is about 30 times larger and more than 1,300 times brighter than the planet Venus. Interested skywatchers can recreate the phases of the moon with an easy at-home experiment. Of course, if you move the tennis ball to another position, its phase will change because its angle of illumination changes. For instance, you can move the tennis ball in such a way that it appears completely illuminated (a "full" moon) or only half illuminated, confusingly called a "quarter" moon. The "quarter" that is being referenced has nothing to do with the moon's physical appearance; rather, it refers to the moon's position in orbit around the Earth. The time it takes the moon to go through its entire cycle of phases is 29.53 days, measured from one new moon to the next. At a new moon, from our Earthly perspective, the moon appears in the same part of the sky as the sun. Hence, we never can see the new moon (unless it is crossing directly in front of the sun to cause an eclipse). Skywatchers call it a "new" moon because it is the beginning of a new lunar cycle. But the half-moon (first quarter) occurs when the lunar body completes the first quadrant of its phase cycle, about 7.4 days after new moon. At this particular phase, the moon rises six hours (or one-quarter of a day) after the sun, generally around noon. We see it at its highest point in the southern sky at sunset, and it sets at around midnight. The full moon, which comes about 14.8 days after new moon, is opposite to the sun in the sky; its disk is completely in sunlight. It rises at sunset, stands highest in the sky at midnight and sets at sunrise. The morning half-moon (last quarter) occurs when the moon completes the third quadrant of its phase cycle, about 22.1 days after new moon. At this particular phase, the moon rises six hours (or one-quarter of a day) before the sun, generally around midnight. We see it at its highest point in the southern sky at sunrise, and it sets around noon. And between first quarter and full moon, and full moon and last quarter, we see the moon in its most-seen phase: the gibbous moon. Between first quarter and full phase it can be seen rising in the afternoon and remaining in the sky until well past midnight. Between full and last quarter, it rises in the late evening and remains in view until after sunrise. 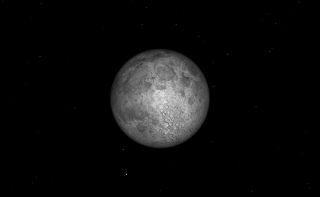 When the upcoming full moon rises on March 5, the moon will be at apogee — its farthest point from Earth, at a distance of 252,515 miles (406,384 kilometers). It will, in fact, be the smallest full moon of 2015. See if you can detect its smaller-than-normal size that night. Because of this, the moon will also travel relatively slowly in its orbit. Both effects will combine to make its motion across the sky especially small from night to night. The defect of illumination on the moon's disk — the dark sliver near its edge — will be very slight on the nights of March 4 and March 6. As such, the moon will likely appear "full" for at least three nights in a row. Editor's Note: If you take an amazing photo of the moon or any other skywatching sight that you'd like to share for a possible story or image gallery, please contact managing editor Tariq Malik at spacephotos@space.com.